Greenland's Christmas traditions are unique, right down to the fact that Christmas trees have to be imported because it's too cold in Greenland for them! In Greenland, local Christmas customs are similar to those of Denmark because of its political affiliation. Trees are decorated and adorned with candles, paper hearts, paper flowers, and more trees as well as Greenland and Danish flags. Gifts are placed underneath the tree. The Greenlanders have a special diet, of course, for this special celebration. On the festive table, you will find seal, whale, and reindeer meat. Special delicacies such as mattak (whale skin) and kiviak (a dish of meat, fat, blood, herbs, and berries, which is wrapped in Robbenbalg and preserved by freezing) are included, as well as halibut and smoked salmon. A typical, traditional Greenlandic Christmas begins on the fourth Sunday before Christmas (the first day of Advent). In Greenland, this an important day celebrated in churches and homes. Local men may wear the white anorak typical for festive dates, while others may be in the traditional Greenlandic costume. In the weeks leading up to Christmas in Greenland, colorful decorations are put up and illuminated Christmas stars are hung in many windows. Every village in Greenland puts up a lit Christmas tree on a hill, so everyone can see it. Whoever can afford to have a tree sent from Denmark decorates it at home on December 23. Typical tree decorations include candles, ornaments, and handcrafted items. Children go from house to house in traditional Greenlandic costumes singing their carols and it is, all in all, a truly magical experience. Keep in mind, too, that there is no daylight in Greenland in December and you will understand why the charm of the holiday season with all its candles and decorations seems even more special here in Greenland. While it can be very cold, it is very heart-warming, and goosebumps are guaranteed. On Christmas Eve, there is a popular church service that is attended by many in the national Greenlandic dress or white anorak. Following that, an important part of Christmas in Greenland are coffee and cakes, along with mattak and kiviak. Presents often include traditional model sleds for children or locally crafted clothing. 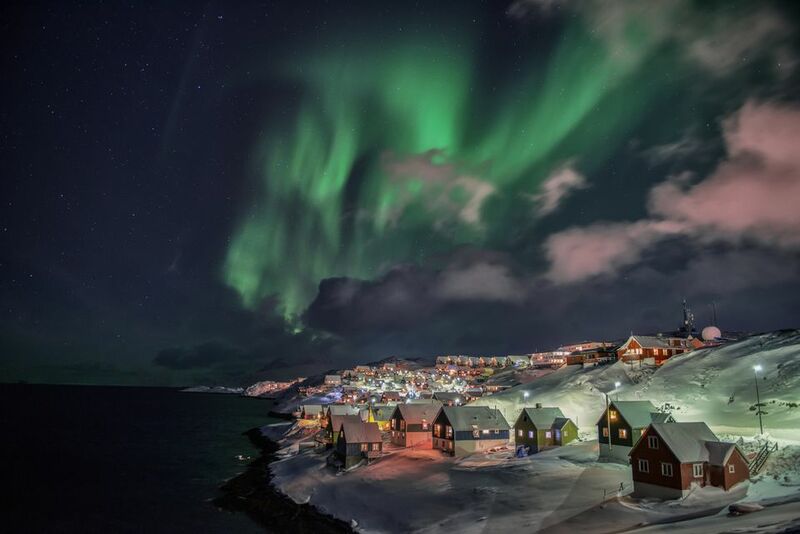 Greenland quiets down at the end of December awaiting the New Year. The locals actually celebrate it twice! There's the Danish New Year at 8 p.m. Greenland time and then the true Greenlandic New Year is celebrated at midnight local time. It's a beautiful sight when you catch the Northern Lights at the same time!